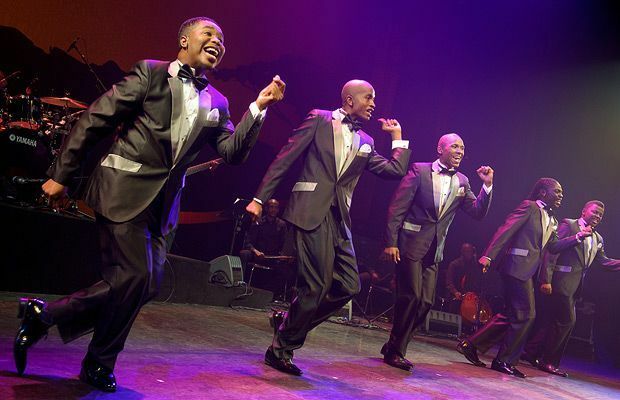 Walking onto the stage decked out in sharp grey suits with crisp white shirts, the four tenors of this South African a cappella group look every inch the 90s R&B act, and while their Soweto Afro-Pop Opera confirms that they do love a good slow jam, they have more strings to their bow than that. Showcasing the folk and traditional songs sung by Soweto singers in the urban areas of Johannesburg, it is a tour-de-force of vocal harmonies as the singers and their accompanying band touch on traditional African, Motown, gospel, and opera styles. Their highly enjoyable hour-long set is made up of renditions of township standards – including Ladysmith Black Mambazo’s ‘Nomathemba’ and Johnny Clegg’s ‘Asimbonanga’ – and although the tenors are the stars of the show here, the band is tight. Lush strings, drumming and accomplished trumpet playing bring the sound together, with the latter even including bursts of staccato free-jazz, which weaves with the vocals surprisingly well. There is spontaneous dancing throughout from audience and band members alike, and apart from one questionable dance scene involving a chair, the performance is spirited and exudes a genuine sense of celebration and joy that ultimately can’t be manufactured. Underbelly, Bristo Square, 0844 545 8252, until 25 Aug (not 12), 12.55pm, £13–£14.50 (£11–£12). Vilakazi Entertainment Group (PTY)LTD Soweto Afro-Pop is a versatile ensemble showcasing pop, a capella and motown, African and classical music accompanied by a string quartet and a four-piece band in a fresh, vibrant township style.